The Cyber-shot HX20V’s sensor is an 18.2-million-pixel, 1/2.3in Exmor R CMOS unit. As with previous Exmor R models, this backlit device works alongside a Bionz processor to deliver images with low noise. Its relatively small size allows a long zoom from the small optic. The 4.5-89mm lens provides a 35mm equivalent of 25-500mm (20x zoom) with a maximum aperture of f/3.2-5.8. 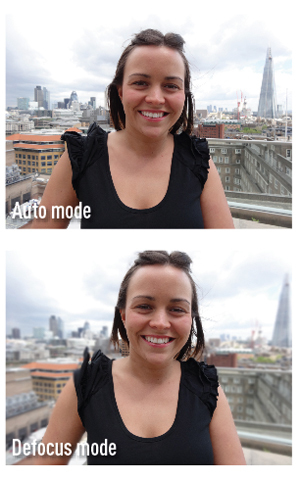 Image: The defocus mode is effective at blurring the background when the subject is at close range. The maximum ISO sensitivity has been increased from ISO 1600 to ISO 3200 in iAuto mode and ISO 12,800 in Superior Auto mode. In program and manual shooting the maximum ISO is 1600. The lens is stabilised with Optical SteadyShot technology, while the Clear Image zoom is claimed to extend the zoom to 40x while maintaining the same resolution using its Pixel Super Resolution technology. The camera features fully manual operation via the M mode on the shooting dial, although only two aperture choices are available at any one time and these vary depending on the zoom position of the lens. A choice of f/3.2 or f/8 is available at the widest zoom. However, this still allows a choice between a large depth of field and a relatively small one, depending on the subject. The program mode, also on the dial, is therefore more useful and ±2EV exposure compensation can be accessed easily using the custom button on the rear. For creative use there is a choice of centre and spot metering, as well as multi mode. The white balance includes seven presets and a manual white balance from a custom reading as well as auto white balance. Image: The Superior Auto mode allows a greater dynamic range to be captured through a quick burst of shots and image processing. There is also exposure and white balance bracketing. What is notable on the HX20V is the lack of a raw-capture option to save the unprocessed file. However, this is not unusual for a camera at this level. This camera’s strength is its processing, and for this it needs to use JPEG files. There are two auto modes on the dial, comprising an Intelligent Auto (iAuto) and a Superior Auto or iAuto+. Intelligent Auto recognises the scene and then picks the most appropriate scene mode to use. In Superior Auto mode the camera picks the appropriate scene mode, then takes a very quick burst of images (10fps) and processes them, according to the conditions, to make one image. The modes include handheld twilight, anti-motion blur and backlight correction HDR processing. On top of these, the HX20V also features a background defocus mode, 15 scene modes, 3D capture, iSweep panorama and full HD (50p) video capture. There is even GPS tracking to log picture locations and allow you to retrace your steps using the PC software provided.